Updated from the iconic Bugaboo Classic+, the new Bugaboo 3 Plus Classic has all of the style and a little more. A re-designed, modern styled frame with sophisticated and refreshed Grey Melange fabrics and leather-look features. 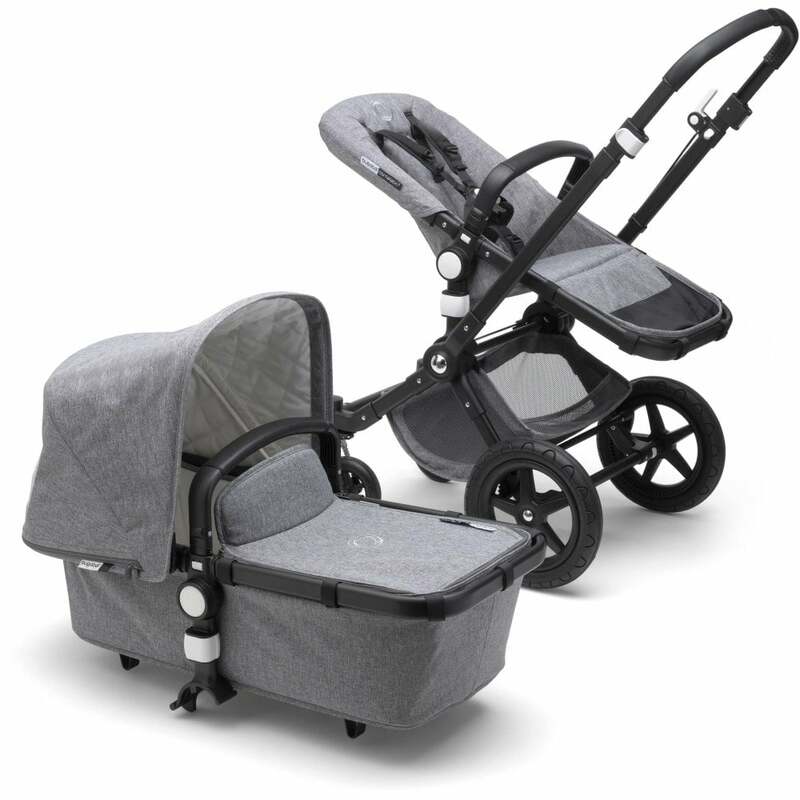 Suitable from birth using the large, spacious carrycot. The seat unit is reversible offering forward or rearward facing for baby and has a three position tilt. The large extendable canopy gives ample cover and shade from the sun and elements. The unique 2 wheel position of the Cameleon is still a superb feature for making travel on sand or snow a much easier task. A suitably large under-seat air mesh basket gives plenty of storage with easy all-round access. The two large foam filled 12 inch rubber wheels and two 6 inch swivel wheels have adjustable suspension for a comfortable and smooth ride. The carrycot can be easily removed whilst holding the handle with one hand and then pressing each button to release the frame from the chassis. The Bugaboo 3 Plus Classic has a 2 position brake handle on the chassis within easy reach of the handlebar and a compact fold for easy storage. A five point safety harness keeps baby safe and secure in the seat unit and all of the fabrics are machine washable. Sophisticated grey melange fabrics and leather-look features. Reversible seat and height adjustable handlebar. Two foam-filled rubber 12-inch wheels, two 6-inch swivel wheels with adjustable suspension. 2 Wheel position for sand and snow. Adjustable suspension in the swivel wheels for manoeuvrability. Adaptable to various car seats. Height adjustable 6 position telescopic handlebar. Large Seat and carry cot frame. Carrycot can be released whilst holding the handle with one hand, then pressing the buttons separately. Mattress with aerated inlay for extra air circulation.